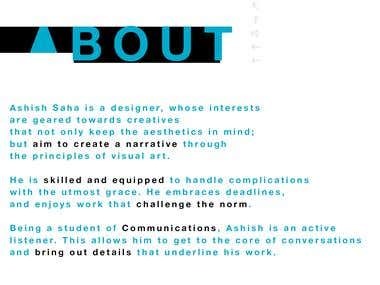 Ashish Saha is a dedicated Graphic Designer, Motion Graphics Editor and Video Editor. He has successfully completed numerous projects for a number of clients for both local and national projects, as well as certain international event related projects, in the last 4 years. His skills range from Adobe Creative Suite, namely Photoshop, Premier Pro and After Effects; as well as Videography and Photography. In his leisure time, Ashish Saha is also a budding Music Photographer and Writer, having shot for a number of bands all around the country as well as touring with some of them. Handles all post production related projects such as editing, color correction, and such for documentary films, television advertisements, etc. as well as motion graphics for commercials, music videos, etc. Official photographer for AIFF, to cover Shillong Lajong FC home matches of I-League 2015-16. On demand, freelancer for Light Park Studios which caters to clients looking to park all their media, graphics & video related worry at their doorsteps.